From special occasions to midnight snacks, this cake can stand up to any craving. It tastes great and is great for you. Go ahead, have another slice! Full of fresh carrots containing high amounts of vitamin A and beta-carotene, this moist carrot cake is an easy guilt-free choice. Among its many health benefits, the vitamin A found in carrots has been proven to improve vision, prevent various cancers, and protect skin from sun damage. In addition, diets rich in beta-carotene can produce results in both anti-aging and the prevention of heart disease. An ingredient that might be new to you is the Ener-G Egg Replacer. It is an egg substitute that is made from tapioca and potato starch. With only 10 calories per serving, Ener-G Egg Replacer allows you to create egg-free baking goods without sacrificing the taste. If you have any trouble finding it at your supermarket, check their website for a listing of local grocery stores by clicking here. 1. Preheat your oven to 350° F and spray Bundt pan with canola baking spray. 2. In a large bowl, combine the whole wheat flour, spelt flour, Ener-G Egg Replacer, baking powder, baking soda, cinnamon, and salt. 4. After slightly whisking the dry ingredients into a uniform mixture, add the wet ingredients from the separate bowl and stir. 5. Gently fold in the chopped pecans. 6. Pour the mixture into the oiled Bundt pan, making sure that it is evenly spread, and bake for about 40 minutes until the cake is golden brown and slightly firm to touch. 7. While cake is baking, start making the lemon drizzle. 8. In a stand mixer, cream the Earth Balance Buttery Stick, agave, and maple syrup together. 9. After adding the Tofutti cream cheese, soymilk, and lemon zest, continue to cream the mixture until it is uniform and loose. 10. After allowing the cake to cool, place a flat plate over the top of the pan. 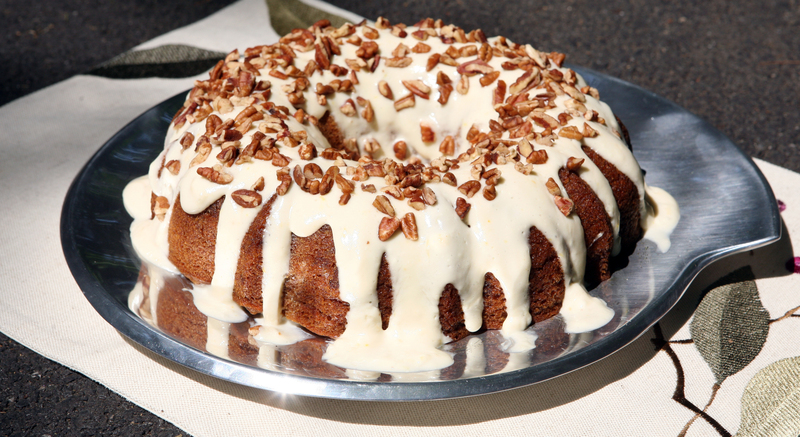 Holding both the plate and the Bundt pan, carefully turn the two over until the cake drops onto the plate. 11. Remove the pan, frost the cake with the lemon drizzle by spooning the mixture over the cake (allowing the mixture to fall down the sides), and top with the remaining chopped pecans. Thanks Margaret! We added the RSS feed subscription. We appreciate your input! Thanks Eric. We should talk about a guest posting. I’ll contact you.